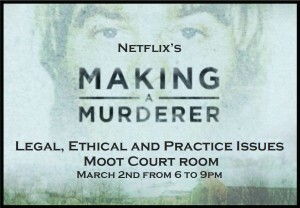 Please join the Pace Criminal Justice Institute (PCJI) on Wednesday, March 2, 2016 at 6:00-9:00 PM in the Pace Law School Moot Court Room for an event: Legal, Ethical and Practical Issues: A Panel Discussion on the Netflix Documentary Series ‘Making A Murderer’. Join us as panelists including Professors Carol Barry, David Dorfman, Lissa Griffin, Jill Gross, and alumnus Chris McNerney (’06), Chief of Greenburgh Police, discuss the legal and ethical issues raised by this documentary. Attendees can earn up to 3.5 CLE credits (1.5 ethics and 2.0 professional practice). Lissa Griffin, Making a Murderer: A Broader Debate, Pace Criminal Justice Blog (Jan. 29, 2016). Netflix – Making a Murder. Yoni Heisler, Making a Murderer, BGR (Jan. 14, 2016). Jack Murtha, The Media’s Complicated Role in Making a Murderer, Columbia Journalism Review (Jan. 7, 2016). Mike McPhate, Record Number of False Convictions Overturned in 2015, New York Times (Feb. 3, 2016). How ‘Making a Murderer’ Exposes Flaws in Juvenile Justice System, MPR News (Feb. 1, 2016). 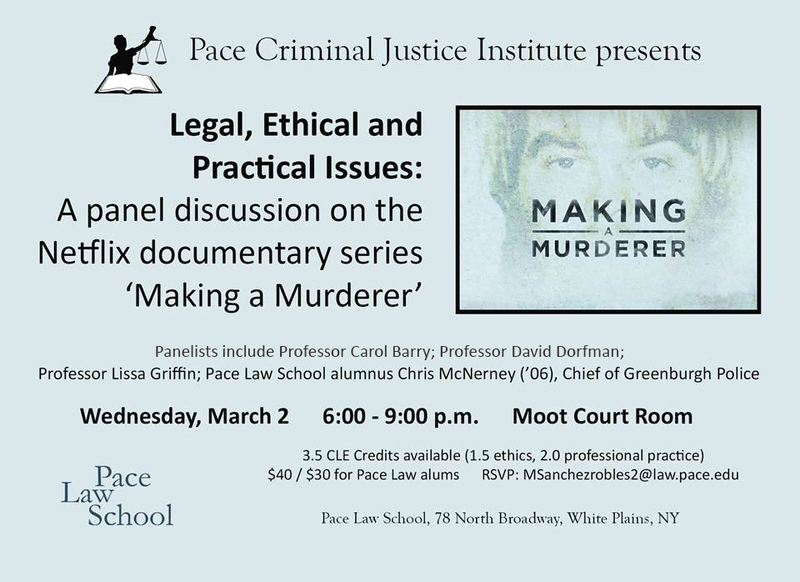 Please join the Pace Criminal Justice Institute on Wednesday, March 2, 2016 at 6:00-9:00 PM in the Pace Law School Moot Court Room for an event: Legal, Ethical and Practical Issues: A Panel Discussion on the Netflix Documentary Series ‘Making A Murderer’. 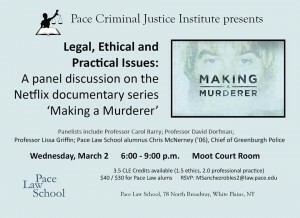 Join us as panelists including Professors Carol Barry, David Dorfman, and Lissa Griffin, and alumnus Chris McNerney (’06), Chief of Greenburgh Police, discuss the legal and ethical issues raised by this documentary. Attendees can earn up to 3.5 CLE credits (1.5 ethics and 2.0 professional practice).